The potentially historic midterm elections are a week away and left-wing voices are getting more shrill and paranoid than ever before. On CNBC’s Oct. 26 “The Call,” left-wing talker and frequent MSNBC guest Mike Papantonio went on a nearly six-minute conspiratorial, anti-corporation, anti-conservative candidate rant suggesting GOP U.S. Senate hopeful Sharron Angle was raising secret money from the Chinese government in order to help them ship American jobs overseas. Throughout the last half-century, time and time again, a means to stimulate an ailing economy has occurred through tax cuts. Former Presidents John F. Kennedy, Ronald Reagan and George W. Bush have proven economic relief is most effective through tax cuts - not government spending. Still that method has detractors. However, CNBC "The Call" co-anchor Trish Regan, with a panel decidedly against her, made the case for tax cuts. On NBC's July 11 broadcast of "The Chris Matthews Show," Regan explained how tax cuts encourage businesses to help reverse the trend of high unemployment and that businessmen are worried about the end of the Bush tax cuts. "They absolutely are," Regan said. "They're concerned about it and this is one of the issues when it comes to hiring. They're hesitant right now when it comes to bringing more employees on board because one, you're not seeing final demand because consumers aren't spending that much, and number two, they're dealing with the tax consequences of having more people in their companies. So that's definitely an issue." Vintage Santelli – Rips Obama's Keynesian-ish Policies: Why Does My Share Have to Pay for California's Teachers? This is one of those "I told you so" moments conservatives should really be out publicizing: The $787-billion stimulus passed early 2009 - it's not working. And on CNBC's June 25 broadcast of "The Call," CME Group floor reporter Rick Santelli explained that all government spending is not created equal, and President Obama's so-called stimulus spending was for government payrolls and not the infrastructure improvement is was sold to be. "Well, you know, it's all about, in my opinion, definition and choice," Santelli said. "Definition, I don't disagree with our guest, Richard [DeKaser, president of Woodley Park Research], about stimulus, but I haven't seen any stimulus. I've seen a lot of spending. And in terms of choice, austerity isn't something people are going to volunteer for. The creditors are going to force it on them. I think these issues are much different than we're selling them. You know, we don't have a new Hoover Dam. We don't have a new electric grid. We paid a bunch of salaries and benefits and extension benefits, unemployment with a lot of that money that you save jobs because you paid teachers because states couldn't afford it I don't think any of that really falls under a definition of stimulus." "Myself and most of the people I know don't know the metric system or can't do the conversion charts very well." So said CNN's Rick Sanchez Monday in response to criticism that he has taken for his absolutely pathetic coverage of Saturday's tsunamis in Hawaii. 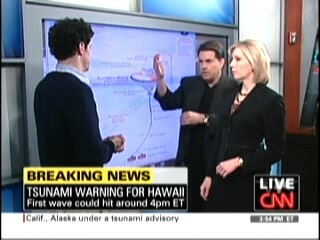 As NewsBusters previously reported, Sanchez manically pestered a scientist brought on to CNN's set Saturday to explain what was happening in the Pacific Ocean and how it might impact Hawaii. As Dr. Kurt Frankel discussed the ramifications of a nine meter drop observed in the ocean following the massive earthquake in Chile, Sanchez said, "By the way, nine meters in English is?" Here we go again. We've already seen how ineffective the previous $787-billion stimulus Congress and the President forced through earlier this year has been with curbing unemployment, as it has raced into double-digits over the previous months. But will there be an effort to force through another one? Earlier this week, Speaker of the House Nancy Pelosi made overtures of another stimulus in a conference call. CNBC's Erin Burnett noted the possibility of a push for a second stimulus on the network's Nov. 27 "The Call." "John, what would you say, I don't know, the chances of some sort of an additional jobs stimulus - however you'd like to characterize that, or whatever form it would take or price tag it might have ?" Burnett asked. It's an issue that libertarian Rep. Ron Paul, R-Texas, and Sen. Bernie Sanders (I-Vt.), a self-proclaimed socialist agree on: Congress should have the authority to call for the Federal Reserve to be audited. But it is also something that some in the financial media are reluctant to support, especially judging from the tone of CNBC "The Call" co-host Trish Regan and comments CNBC senior economics reporter Steve Liesman. On the Nov. 20 broadcast of "The Call," CME Group reporter Rick Santelli made the case that Federal Reserve should be audited. He cited opposition to the Fed audit proposal from Sen. Judd Gregg, R-N.H., which was based on Congress' inability to be fiscally responsible. "He said, ‘You know, there independence is important to protect the soundness of the dollar,'" Santelli said. "Has he read any papers lately or looked at any charts? Come on. Amen, amen that this process is happening. They're not taking away their independence to make a decision on interest rates. We need to know where the money is going. I remember when Ben Bernanke faced committees of elected officials and said, ‘We can't audit the Fed because then you might look unfavorably on some of the counterparties we deal with. That's like finding paraphernalia under your kids bed and then not asking where he got it." It's the new "C" word according to Melissa Francis, co-host of CNBC's "The Call." Using the word "cartel" to describe OPEC is officially a no- no. Francis: When do you think we'll hit that $75-to-80 range that seem like almost everybody in the cartel agrees is sort of the equilibrium price? Al-Naimi: You have to be careful calling OPEC a cartel. I resent that. For whatever reason, CNBC keeps lining up challengers to take on its Chicago Mercantile Exchange floor reporter Rick Santelli over his self-reliance, pro-taxpayer persona - whether it's Steve Liesman, Arianna Huffington or this time, Keith Boykin - editor of The Daily Voice, a CNBC contributor and a BET TV host. ON CNBC's May 7 "The Call," Santelli took on Boykin in the program's "The Call of the Wild" segment. Boykin was armed with the usual anti-George W. Bush talking points to defend President Barack Obama and his policies. "Look what he inherited first of all," Boykin said. "He didn't inherit anything," Santelli said. "He ran for office, it was his choice." If CNBC on-air talent has really had their hands tied by General Electric and NBC management on criticizing the current administration's economic policy, you couldn't tell it from watching Rick Santelli and Larry Kudlow. On CNBC's April 24 "The Call," Santelli expressed his frustration with an overreaction by the government to solve the financial crisis when Kudlow asked him about the expansion of bailout obligations from the original TARP bailout price tag $750 billion to the $3 trillion. "Listen - I'm glad I didn't say that, I'm glad I didn't say all that," Santelli said. "Do I disagree with it? Probably not. But, I'll take it a step farther - in the beginning, whether it was the commercial paper program, there was a need just like babies have a need for milk. But I don't need to drink a couple of gallons anymore." For the second time in a week, CNBC's Rick Santelli faced down one of the standard-bearers of liberalism. First, he explained to Huffington Post editor and founder Arianna Huffington on the March 31 "Squawk Box" that markets are more efficient in correcting economic hardship, in the banking and housing sectors. On CNBC's April 3 "The Call," Santelli took on University of California at Berkeley economics professor and former Secretary of Labor for President Bill Clinton, Robert Reich. According to Reich, the agreement brokered between President Barack Obama and other G20 leaders - to give the International Monetary Fund (IMF) $1.1 trillion - was positive and should be celebrated.